As demographers convene in Chicago for the Population Association of America’s annual meeting, here is a look at 10 of Pew Research Center’s recent findings on demographic trends, ranging from global refugee and migrant flows to changes to family life and living arrangements. They show how demographic forces are driving population change and reshaping the lives of people around the world. 1. Millennials are the United States’ largest living generation. In 2016, there were an estimated 79.8 million Millennials (ages 18 to 35 in that year) compared with 74.1 million Baby Boomers (ages 52 to 70). The Millennial population is expected to continue growing until 2036 as a result of immigration. By some measures, Millennials have very different lives than earlier generations did when they were young. They’re slow to adopt many of the traditional markers of adulthood. For the first time in more than 130 years, young adults are more likely to be living in their parents’ home than in any other living arrangement. In fact, a larger share of them are living with their parents than with a romantic partner – marking a significant historical shift. More broadly, young adult geographic mobility is at its lowest level in 50 years , even though today’s young adults are less likely than previous generations of young adults to be married, to own a home or to be parents, all of which are traditional obstacles to moving. 2. Americans’ lives at home are changing. Following a decades-long trend, just half of U.S. adults were married in 2015, down from 70% in 1950. 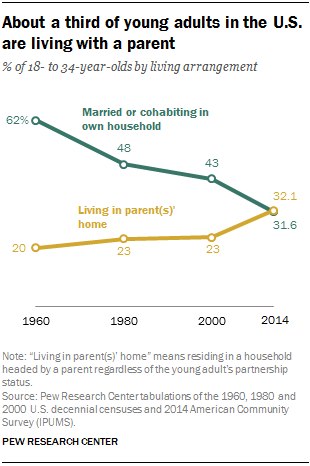 As marriage has declined, the number in cohabiting relationships (living with an unmarried partner) rose 29% between 2007 and 2016, from 14 million to 18 million. The increase was especially large among those ages 50 and older: 75% in the same period. The “gray divorce” rate – divorces among those 50 and older – roughly doubled between 1990 and 2015 . Also, a record number of Americans ( nearly 61 million in 2014 ) were living in multigenerational households, that is, households that include two or more adult generations or grandparents and grandchildren. Growing racial and ethnic diversity in the U.S. helps explain some of the rise in multigenerational living. The Asian and Hispanic populations overall are growing more rapidly than the white population, and those groups are more likely than whites to live in multigenerational family households. 3. Women may never make up half of the U.S. labor force. Women accounted for 46.8% of the U.S. labor force in 2015, similar to the share in the European Union . Although women comprised a much larger share of the labor force in 2015 than in 1950 (29.6%), the Bureau of Labor Statistics projected the share of women in the workforce will peak at 47.1% in 2025 before tapering off. For those women who do work, the gender pay gap has narrowed . Women earned $0.83 for every $1 a man earned in 2015, compared with $0.64 in 1980. The pay gap has narrowed even more among young adults ages 25 to 34: Working women in that age range made 90% of what their male counterparts made in 2015. At the same time, women continue to be underrepresented in leadership positions in the U.S. In 2017, women make up 19% of the U.S. Congress and about a quarter of state legislatures; some 8% of U.S. governors and 5% of Fortune 500 CEOs are female. 4. Immigrants are driving overall workforce growth in the U.S. As the Baby Boom generation heads toward retirement, growth in the nation’s working-age population (those ages 25 to 64) will be driven by immigrants and the U.S.-born children of immigrants, at least through 2035. Without immigrants, there would be an estimated 18 million fewer working-age adults in the country in 2035 because of the dearth of U.S.-born children with U.S.-born parents. However, immigrants do not form a majority of workers in any industry or occupational group, though they form large shares of private household workers (45%) and farming, fishing, and forestry occupations (46%). Public opinion has turned more positive when it comes to immigrants’ impact on the U.S. workforce. The share of Americans saying that the growing number of immigrants working in the country helps American workers increased 14 percentage points in the last 10 years, from 28% in 2006 to 42% in 2016. 5. The U.S. unauthorized immigrant population fell in 2015 to below recession levels, and the share of Mexicans within this population declined. There were 11 million unauthorized immigrants living in the U.S. in 2015, lower than the estimated 11.3 million in 2009, the last year of the Great Recession, according to new Pew Research Center estimates . The Center’s preliminary estimate of the unauthorized immigrant population in 2016 is 11.3 million, which is statistically no different from the 2009 or 2015 estimates (and comes from a different data source with a smaller sample size and larger margin of error). The 2016 preliminary estimate is inconclusive as to whether the total unauthorized immigrant population stayed the same or changed in one direction or the other. Mexicans remain the largest origin group of unauthorized immigrants, but their numbers have recently declined and their share of the 2016 preliminary data fell to 50%, the first time since at least 2005 that Mexicans did not account for a majority of this population. As the number of Mexicans decreased, the number of unauthorized immigrants from other parts of the world increased. An estimated 8 million unauthorized immigrants were working or looking for work in 2014 , making up 5% of the civilian labor force. The number was unchanged from previous years and the share was down slightly since 2009. Although the estimated number of unauthorized immigrant workers was stable at the national level from 2009 to 2014, 15 U.S. states had increases or decreases. 6. The share of births outside of marriage declined for immigrant women from 2008 to 2014, but held steady for U.S.-born women. Immigrant women play an important role in overall U.S. fertility trends. 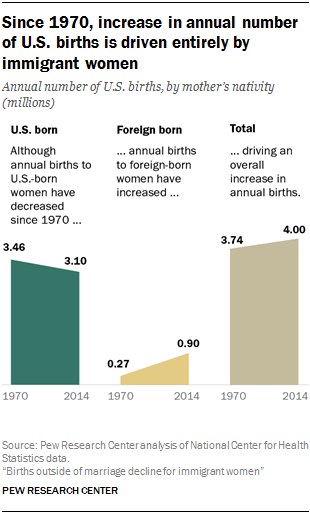 Between 1970 and 2014, the increase in the annual number of U.S. births was driven entirely by immigrant women, while births to U.S.-born women fell. The important role of immigrant women in driving U.S. births stems from both the growth in the foreign-born population and the fact that immigrant women have, on average, more children than U.S.-born women. 7. Globally, babies born to Muslim mothers will outnumber babies born to Christian mothers by 2035 – largely driven by different fertility rates. The number of babies born to Christian mothers (223 million) far outnumbered the number of births to Muslim mothers (213 million) between 2010 and 2015. However, an aging Christian population – especially in Europe and North America – and high fertility rates among Muslim women is rapidly changing the global religious landscape. The number of births to Muslim women is projected to exceed births to Christian women by 2030-2035, with the disparity growing to 6 million by 2055-2060. Between 2010 and 2050, the global Muslim population is projected to grow 73% , while the Christian population will grow just 35%, about the rate of overall global population growth. In contrast, people who do not identify with a religion (“nones”) account for 16% of the world’s population, but only 10% of the babies born between 2010 and 2015, meaning that their projected share of the world’s population will decline. 8. The shares of adults living in middle-income households fell in several countries in Western Europe. In seven of 11 Western European countries examined, the share of adults in middle-income households fell between 1991 and 2010 . The share of the adult population that is middle income decreased in Finland, Germany, Italy, Luxembourg, Norway and Spain ( as it did in the U.S. ), but increased in France, Ireland, the Netherlands, and the United Kingdom. The largest shares of the adult population in middle-income households in 2010 were found in Denmark (80%), Norway (80%), and the Netherlands (79%), while the smallest shares were found in Italy (67%), the UK (67%) and Spain (64%). 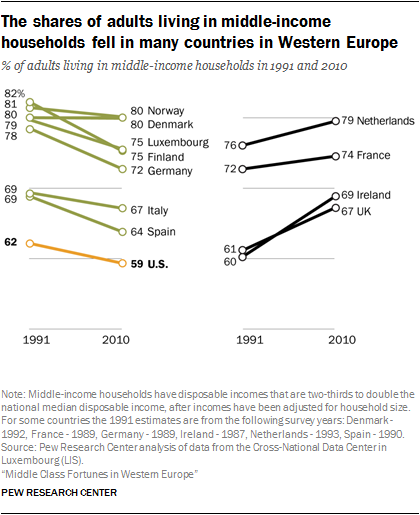 Each of the Western European countries studied had a larger share of adults in middle-income households than the U.S. (59%). 9. European countries received a near-record 1.2 million first-time asylum applications in 2016. Some of these applicants may have applied for asylum in multiple countries or arrived in 2015, raising the total number of applications across Europe. The number of asylum applications was down only slightly from the record-setting 1.3 million applications in 2015. Syria, Afghanistan and Iraq were the most common countries of origin for first-time asylum applications in 2015 and 2016, together accounting for over half of the total. Germany was the most common destination country in Europe, having received 45% of applications. 10. The U.S. admitted 84,995 refugees in fiscal year 2016, the most since 1999. 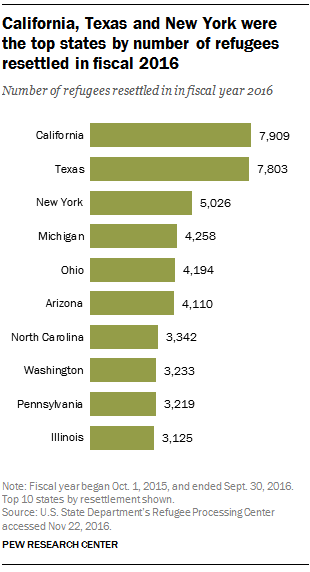 More than half resettled in one of just 10 states , with the largest numbers going to California and Texas. Nebraska, North Dakota and Idaho ranked near the top for the most refugees resettled per capita, with rates over two-and-a-half times the national average. And almost half (46%) of the fiscal 2016 refugees were Muslim , the highest number for any year since refugees’ self-reported religious affiliation became publicly available in 2002.